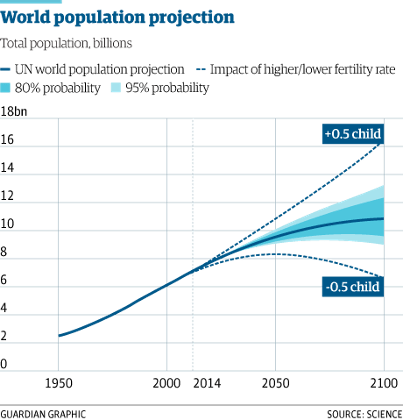 World population to hit 11bn in 2100 – with 70% chance of continuous rise. The world’s population is now odds-on to swell ever-higher for the rest of the century, posing grave challenges for food supplies, healthcare and social cohesion. A ground-breaking analysis released on Thursday shows there is a 70% chance that the number of people on the planet will rise continuously from 7bn today to 11bn in 2100. The work overturns 20 years of consensus that global population, and the stresses it brings, will peak by 2050 at about 9bn people. “The previous projections said this problem was going to go away so it took the focus off the population issue,” said Prof Adrian Raftery, at the University of Washington, who led the international research team. “There is now a strong argument that population should return to the top of the international agenda. Population is the driver of just about everything else and rapid population growth can exacerbate all kinds of challenges.” Lack of healthcare, poverty, pollution and rising unrest and crime are all problems linked to booming populations, he said. “Population policy has been abandoned in recent decades. It is barely mentioned in discussions on sustainability or development such as the UN-led sustainable development goals,” said Simon Ross, chief executive of Population Matters, a thinktank supported by naturalist Sir David Attenborough and scientist James Lovelock. “The significance of the new work is that it provides greater certainty. Specifically, it is highly likely that, given current policies, the world population will be between 40-75% larger than today in the lifetime of many of today’s children and will still be growing at that point,” Ross said. Many widely-accepted analyses of global problems, such as the Intergovernmental Panel on Climate Change’s assessment of global warming, assume a population peak by 2050. Sub-saharan Africa is set to be by far the fastest growing region, with population rocketing from 1bn today to between 3.5bn and 5bn in 2100. Previously, the fall in fertility rates that began in the 1980s in many African countries was expected to continue but the most recent data shows this has not happened. In countries like Nigeria, the continent’s most populous nation, the decline has stalled completely with the average woman bearing six children. Nigeria’s population is expected to soar from 200m today to 900m by 2100. The cause of the stalled fertility rate is two-fold, said Raftery: a failure to meet the need for contraception and a continued preference for large families. “The unmet need for contraception – at 25% of women – has not changed in for 20 years,” he said. The preference for large families is linked to lack of female education which limits women’s life choices, said Raftery. In Nigeria, 28% of girls still do not complete primary education. The research, conducted by an international team including UN experts, is published in the journal Science and for the first time uses advanced statistics to place convincing upper and lower limits on future population growth. Previous estimates were based on judgments of future trends made by researchers, a “somewhat vague and subjective” approach, said Raftery. This predicted the world’s population would range somewhere between 7bn and 16bn by 2100. “This interval was so huge to be essentially meaningless and therefore it was ignored,” he said. But the new research narrows the future range to between 9.6bn and 12.3bn by 2100. This greatly increased certainty – 80% – allowed the researchers to be confident that global population would not peak any time during in the 21st century. Previous AMATORA 2017 : Ntawukuriryayo azize kwanga guhindura itegekonshinga!? Rutaremara na Makuza bazabikora. Next “Ebola and AIDS are bio weapons being tested on Africans” Scientists allege.